Fatih, who has sailed with Mendelblatt since they teamed up for London 2012, observed: “We’re fortunate to be in this position: Robert is an amazing sailor, the benchmark so if you can stay up with him, you’re happy.” However following their 15-4-4 score today, gaining the lead was a surprise. “It was a struggle – we didn’t feel great on the boat. We weren’t terrible, it just wasn’t as smooth as normal.” However while today’s first race became their discard, Scheidt and Boening had to count their 12th in race two. 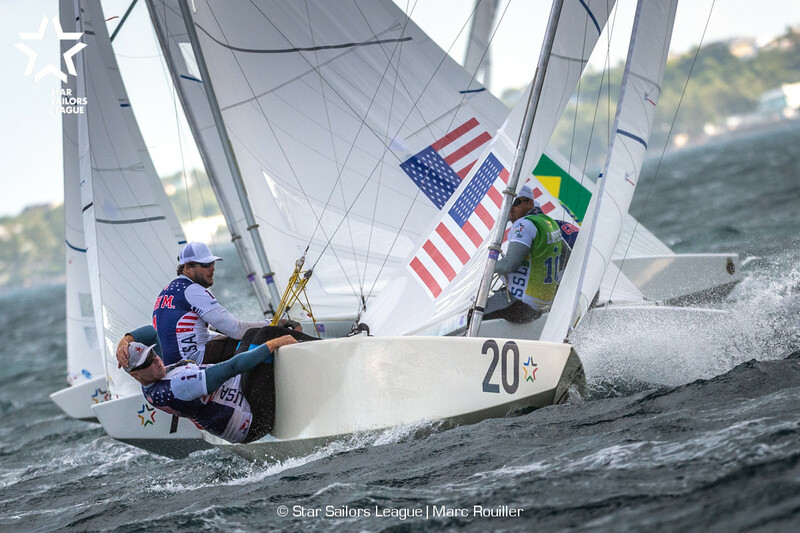 Top scoring helm today was Finn sailor, was Jorge Zarif, the 2013 Finn Gold Cup winner and this year’s Star World Champion, and Pedro Trouche, scoring 4-1-2 today elevated the young Brazilians into third overall. Winner of today’s first race were Star veterans France’s Xavier Rohart and Pierre-Alexis Ponsot, who also benefitted from the left side of the first beat. They lead at the top mark and then were never challenged. “It is a good to have a good plan and to be able to run with it to the end, to play the shifts and be a little bit in front of the pack…it was really a text book race,” said Rohart. While many found fortune on the top left of the course, in today’s final race Brazilian veteran Lars Grael and Samuel Gonçalves repeated their tactic from yesterday’s second race, by going hard right, with the same outcome – victory. This has raised them to seven overall. Tomorrow is the final day of Qualifiers at the Star Sailors League Finals and the target is to finish within the top 10 to progress through to Saturday’s Quarter Final. As Zarif observed: “We have four races to go. It is a long way. Let’s see what happens tomorrow.” At present any of the top 22 teams could still make the cut.